According to the World Bank, 78 percent of the world’s poor are rural poor, and many of them are farmers. If you are looking for social returns, there are few better places to invest than in agriculture. Yet, we at the Calvert Foundation see significant unmet capital needs. According to the Catalyzing Agricultural Smallholder Finance report from Dalberg Global Development Advisors, in 2011 there was an estimated $13 billion in demand for smallholder financing that social impact investors could easily address. For these reasons, Calvert Foundation is interested in bringing additional capital to grow this important sector and encouraging other private investors to join as well. Fair trade lending has been an important movement in the agriculture sector, and has led to the creation of critical jobs and economic activity. But how can we learn from pioneer investors like Root Capital and Alterfin, and encourage capital to address the significant gaps in financing for innovations in the value chains for locally consumed crops? As a Calvert Foundation fellow, I spent the past several months reflecting on lessons learned from our existing and historic agriculture portfolio, which consists of approximately $25 million invested across 10 organizations working in Latin America and Africa, and discussing the state of the field with approximately 20 interviewees. Through this process, we have come to better understand why such a large gap exists in agriculture financing and some potential ways to close it. If you prefer to digest your data in charts, please see below. Risk: seasonal cash flows. Banks and lenders are not accustomed to seasonal cash flows, which vary from crop to crop and year to year, depending on the weather and other agricultural risks, such as banana fungus; this volatility and uncertainty can be unsettling for traditional financial institutions. 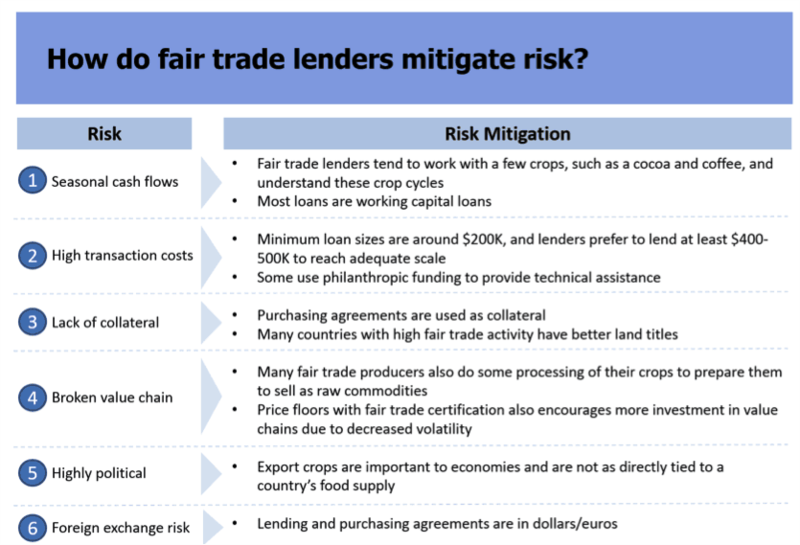 Risk mitigants: To deal with this uncertainty, fair trade lenders tend to work with a few crops, such as cocoa and coffee, and understand these crop cycles and the factors that affect them, like, for example, coffee rust. Additionally, most of these loans are for seasonal working capital. Research/innovation: Several entities recently have published research to educate potential lenders on the agriculture space. Funders are also seeking to leverage big data and analytics to better pinpoint and address risks. Better and more accessible weather technologies are giving farmers better information for planning crop cycles. 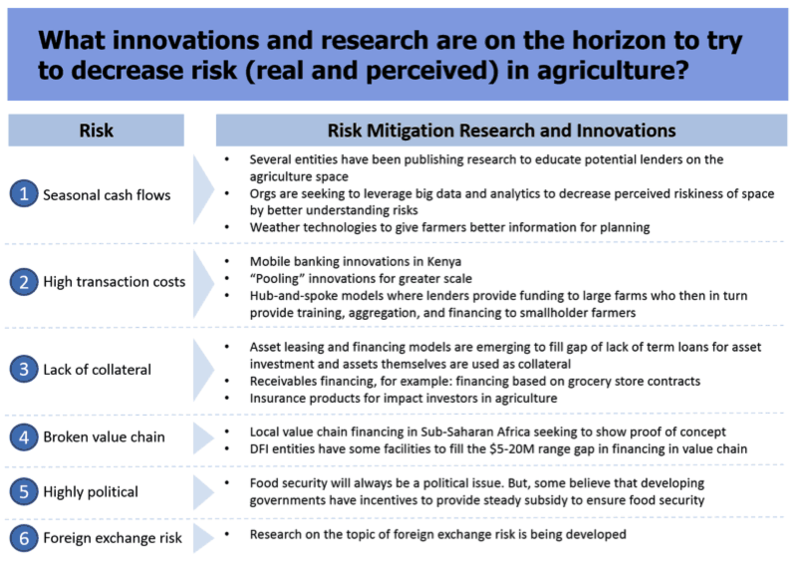 Investment-ready indicators: We need to see new and existing lenders leveraging research and analytics to develop new agriculture specific products. We also need to see more grant funding to lenders to provide risk protection for this high-risk stage of agriculture lending. Finally, we’d like to see scaling up of weather technology innovation (as mentioned above) so that farmers can more effectively mitigate seasonal risks. Risk: high transaction costs. With largely rural and disbursed borrowers, it is expensive to service and monitor agriculture loans. Borrowers often lack financial management skills and knowledge, which require expensive technical assistance. Risk mitigants: Currently, minimum loan sizes are around $200,000, but lenders prefer to lend at least $400,000-$500,000 to reach adequate scale. Some lenders use philanthropic funding to provide technical assistance. Research/innovation: Mobile banking innovations enable farmers to make and receive payments, with Kenya’s MPesa platform as a prime example. Additionally, hub-and-spoke models are developing where lenders provide funding to large farms, which in turn provide training, aggregation and financing to smallholder farmers. Investment-ready indicators: We’re keeping an eye on the Kenyan mobile banking model to demonstrate proof of concept for efficient and secure mobile money transfer. If successful, organizations should scale mobile agriculture lending to other geographies. We’d also like to see the hub-and-spoke models reach breakeven and show commercial viability in a way that meaningfully improves smallholder income. Risk: lack of collateral. In agriculture, land is critical collateral, but poor land titles and courts make it difficult to lend against this asset. Risk mitigants: Purchasing agreements can be used as loan collateral, and many countries with high fair trade activity have better land titles and courts. Research/innovation: Asset leasing and financing models are emerging to fill the gap in term loans for asset investment with the hard assets as collateral. There is increasing interest in receivables financing, for example, providing financing based on grocery store contracts. Another area of interest: insurance products for impact investors supporting agriculture, which are still largely in the development phase. Investment-ready indicators: The aforementioned asset leasing/financing models and receivables financing should reach breakeven and show commercial viability, and we’d like to see the availability of affordable insurance products for impact investors in agriculture. Risk: broken value chains. Especially with local crops, we are seeing under-investment in the entire value chain. We’re also seeing particular gaps in financing initial growth ($50,000-$200,000 level investments) and scale ($4 million to $20 million). This is a contributing factor to the problem of value chain inefficiency (in addition to need for better infrastructure, etc.). Risk mitigants: Many fair trade producers also do some processing of their crops to prepare them for sale as raw commodities; some of the coffee cooperatives we lend to are a good example. Price floors with fair trade certification also encourage more investment in value chains due to decreased volatility. Research/innovation: Many companies are attempting to show proof of concept when it comes to local value chain financing in sub-Saharan Africa , and some development finance institutions have set up financing facilities to fill the $5 million to $20 million range gap in the value chain between micro and SME lenders and commercially viable investments. Investment-ready indicators: Local value chain lending in sub-Saharan Africa needs to show proof of concept by reaching breakeven and showing commercial viability, and we’d like to see more players develop facilities to fill the current financing gaps. Risk: highly political. A country’s food supply is a highly political issue. Agriculture is tied to a country’s infrastructure, both in terms of physical infrastructure and its institutions. Furthermore, scale is a sensitive issue: It promotes efficiency but implies fewer farmers. Risk mitigants: We should be focusing attention on export crops, like coffee, which are important to local economies, but not as directly tied to a country’s food security. Research/innovation: Food security will always be a political issue, but some believe that developing governments have incentives to provide steady subsidy to ensure food security. Investment-ready indicators: Governments are shifting from donor-centric model to “smart” subsidy as catalyst to market-based solutions. Another indicator is governments improving their infrastructure; for example, introducing land and courts reform. This would signal stability in its subsidy models for agriculture. Risk: foreign exchange. Indeed, this issue exists in any sector with a lot of foreign lenders. But many of interviewees cited the lack of affordable hedging mechanisms as a key barrier, especially to lending in sub-Saharan Africa. Risk mitigants: The most effective risk mitigant against exchange rates is executing lending and purchasing agreements in dollars or euros. Research/innovation: While still nascent, research is happening on the topic of foreign exchange risk, mainly within the development banks and financial institutions who recognize this as a major barrier for private investment. Investment-ready indicators: We’d love to see an entity “crack the nut” on foreign exchange risk and prohibitively expensive hedging. 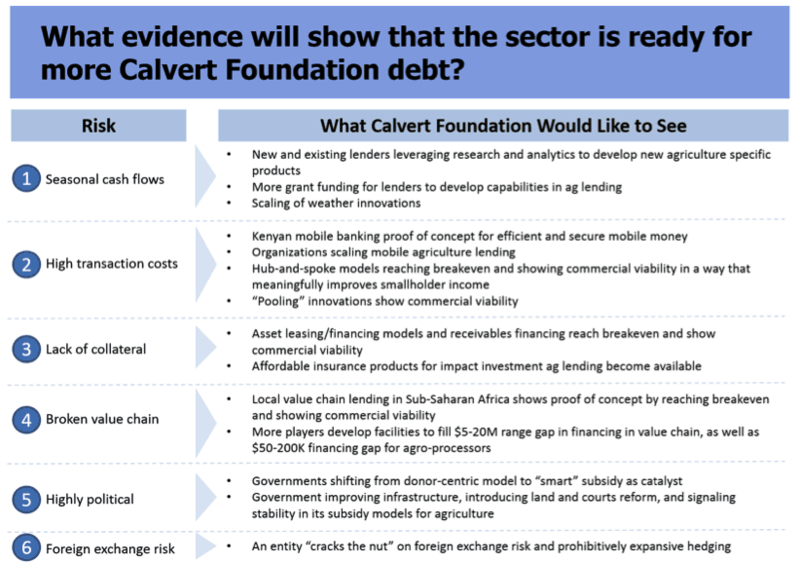 At Calvert Foundation, we plan to engage in some learning deals in the next six-12 months at the intersection of microfinance and agriculture to build our expertise and deepen our understanding of the challenges and risk mitigants as we actively monitor the sector. We hope to continue our dialogue with those working in agriculture finance, follow key innovations, and track new vehicles so we are able to contribute to the creation of vehicles that help break down the barriers to financing a sustainable agricultural sector. In the meantime, we want to hear from you: What ways have you found effective in addressing these risks? Euhbin Song is a Social Impact Fellow for the Calvert Foundation’s Investments Team.